Decide on your filling and fill the sandwiches accordingly. Simple fillings are best: Ham and cucumber, cream cheese, jam, peanut butter, cheese and tomatoe or tuna mayonnaise are good ideas. 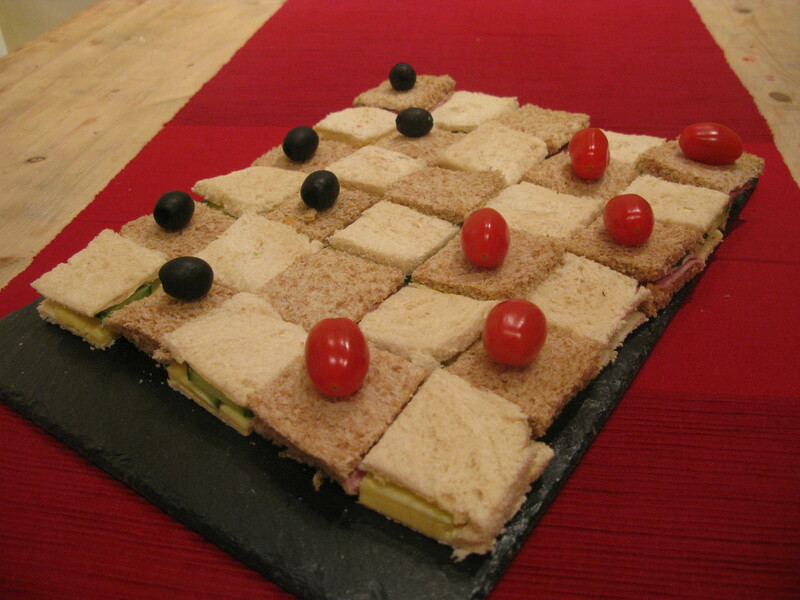 Do keep all your fillings the same though so that the height of the sandwiches are even when you come to laying them out on the plate to make the chess board. Once you have made the sandwiches, slice off the crusts with a serated knife. Then cut your crust less sandwiches into 4 squares. Find a large, flat serving plate to put the sandwiches on and lay out the sandwiches to form a chess/ checkers board pattern, alternating between white and brown. Then place the tomatoes and olives o ntop. You could use grapes instead if you like or those cheese ball crisps. This blog was written by Froggle parties – Specialising in childrens entertainers in Surrey, London, Hertfordshire, Essex, Kent, Buckinghamshire, Berkshire. FOLLOW US ON TWITTER FOR REGULAR PARTY OFFERS!